A bird’s eye view. You can tell that these are going to be good due to the shimmer on the top. Whooooo, that is quite a mouthful. It took me a while to decide on what recipe I would share first. I figured I couldn’t go wrong with anything gluten-free and loaded with chocolate. I love baking. I love sweets. I love creating my own recipes. I love doing all of that stuff because I know what’s in whatever I make won’t kill me. These days, a lot of desserts and pastries have an abundance of nuts in them or are made in a kitchen that handles an abundance of nuts, and that’s scary to me. I learned that if I ever want to enjoy a dessert wholeheartedly, I have to make it myself (which isn’t a bad thing. It actually teaches me self control because if I want something, I have to make it.) I get to be hands on and in control of every aspect of the baking process, something that I can’t appreciate when someone else makes something for me. Now, the best and easiest way to up the nutritional value of whatever you are baking is by swapping out processed wheat flour for something more substantial. I like substituting wheat flour for oat flour. The reason for this is because I always have oats in my pantry. They are cheap, you can buy them in bulk, they last forever, and they can be found anywhere. Yes, a combination flour is usually better (and I will get more into that in a later post), but they are usually costly and are only found in specialty stores. You can’t find specialty flours if you are shopping at Aldi’s, but do you know what you can find? Oats. All you need is a tiny spice grinder and you can make your own oat flour. The same thing can be said about the black beans. I usually like using canned beans because I don’t like cooking them myself, and canned beans can be found in any market. Plus, they are cheap as well. Less than $1 per can. In fact, everything in this recipe is perfect if you are trying to be healthy on a budget because Aldi’s carries it all (I don’t know about the turbinado sugar though, but if you don’t mind white sugar, just use that). 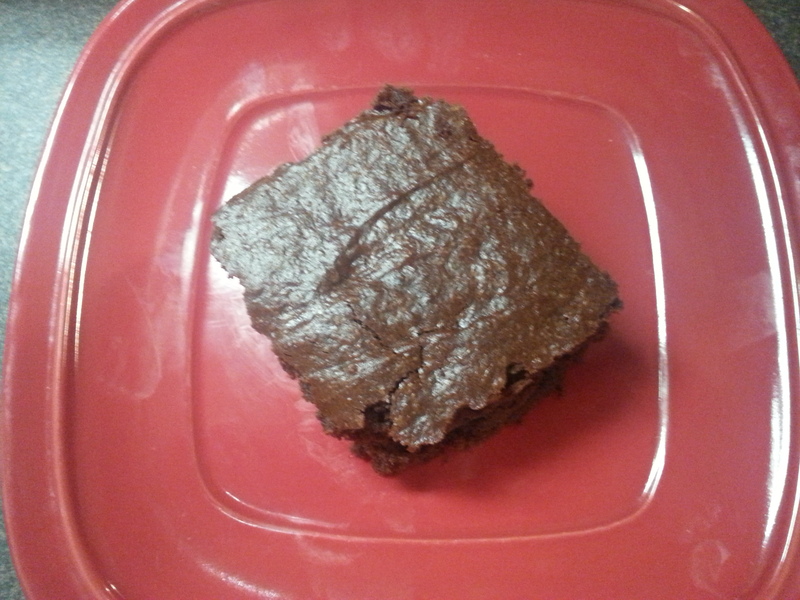 Now, these brownies came to me late at night. I had been going over various bean-baking recipes in my head (I am a huge fan on chickpea blondies,) but these really stood out to me. All of the recipes I had seen were simple and not as indulgent as I would have liked, so I decided to create my own. What could be more decadent than TRIPLE the chocolate?! A part of me wanted to make a chocolate ganache to go on top, but when I pulled these out of the oven, I knew the ganache wouldn’t have made it. 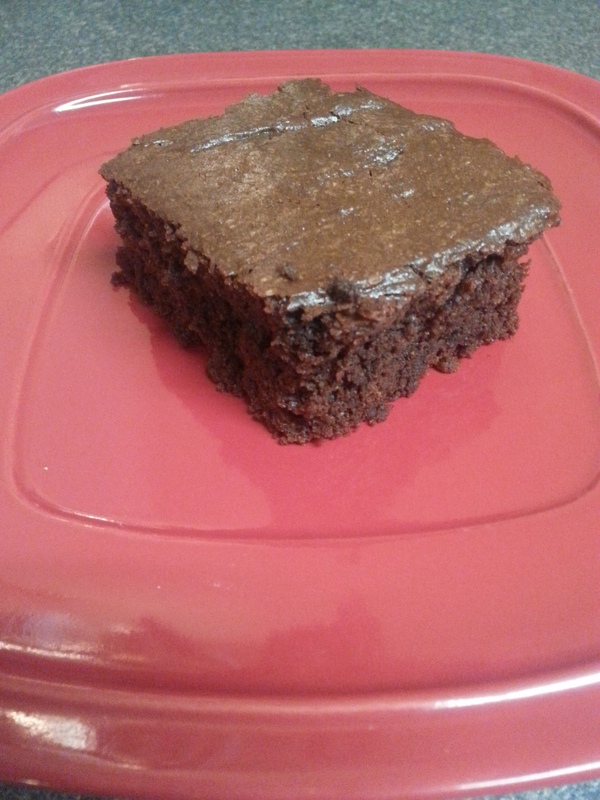 In fact, I had already eaten a piece of the brownies before I even remembered that I was supposed to do a ganache. These are that good. *this is the measurement I use before grinding the oats. I usually use a small spice/ coffee grinder to pulverize them because I get a finer consistency than if I were to use a blender or food processor. In a small saucepan, heat up coconut oil over low to medium heat. Add 1 cup of dark chocolate pieces to the hot oil and stir until melted. Put aside. In a blender, combine black beans and eggs, adding one egg at a time. Blend until smooth and creamy. In a giant mixing bowl, combine cocoa powder, oat flour (I usually grind my own to make sure there’s nothing extra in them), baking powder, and turbinado sugar. Add the coconut oil and chocolate mixture to the dry ingredients. Give it a few stirs (I usually do it this way to make sure the mixture is cool enough so I can add the egg and black bean smoothie without worrying that I’m going to cook the eggs). Add the egg and black bean mixture to everything else and mix until just combined. Grab the last 1/2 cup of dark chocolate pieces and gently stir them in until you have a consistent batter. Pour batter into greased 13 x 9in baking dish and bake for 30-35 minutes, or until a toothpick comes out just barely clean. Like, you want it to be a little dirty. If it’s completely clean, then you’ve overdone it. 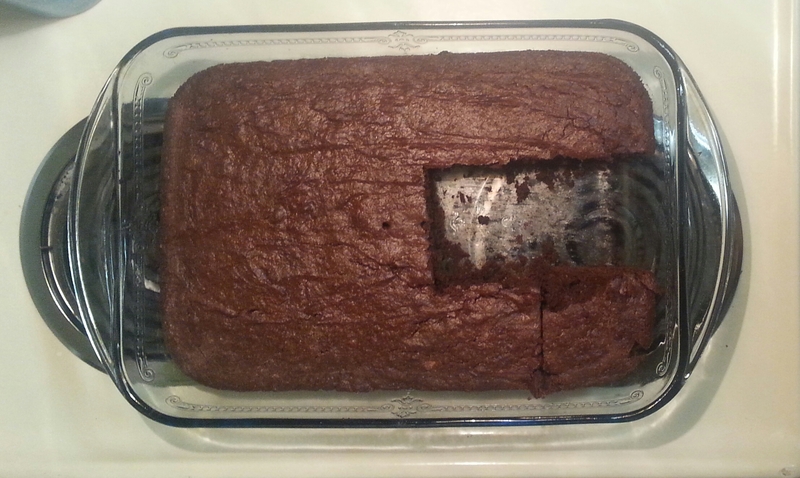 These brownies are supposed to be gooey. Sorry for the hole. I was so eager to eat these, I forgot to grab a before shot.